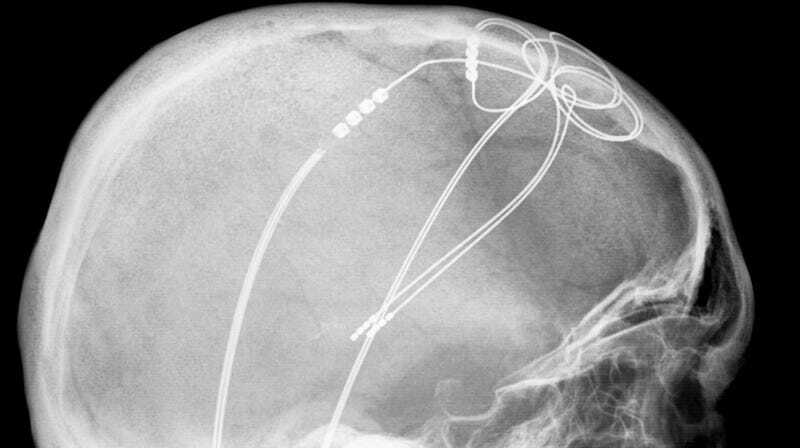 An x-ray image of someone who had electrodes implanted into their brain to manage their Parkinson’s disease. In recent years, doctors have explored an unorthodox method to address cases of depression that haven’t responded to other treatments: sending precise electrical shocks directly to areas of a patient’s brain, otherwise known as deep brain stimulation (DBS). While the technique has shown some promise, its positive effects tend to be inconsistent. But a new study out of the University of California, San Francisco, published Thursday in Current Biology, seems to offer an intriguing step forward for DBS as a therapy for depression. Their research suggests there’s another possible target for stimulation, one that might provide more reliable improvements in mood. Even better, the new target could be free of worrying side effects seen with traditional DBS, like mania. DBS is commonly used to manage neurological conditions like Parkinson’s disease and epileptic seizures. These conditions are characterized by erratic electrical activity in certain brain regions, and the impulses used in DBS—sent through electrodes implanted in the brain via surgery and controlled by a device also usually implanted in the body elsewhere—are thought to act as as a pacemaker, temporarily restoring a healthy brain pattern and easing people’s symptoms. People with depression also tend to have abnormal brain activity, so it’s been theorized that DBS could be helpful for difficult, treatment-resistant cases of depression. The researchers behind the current study had the opportunity to conduct a unique experiment. They were able to study 25 patients with chronic epilepsy planning to undergo a surgery that would temporarily implant electrodes into their brain. The implants would let doctors find out where in the brain the patients’ seizures were coming from, by recording the local neural activity of a targeted brain region (by locating the seizures, the doctors could then plan out how to safely remove the affected parts of the brain at a later time). But for their experiment, the researchers were able to use these same implants to essentially mimic a session of DBS. The patients had implants placed in various areas of the brain, including near the lateral portion of the orbitofrontal cortex (OFC), a region located right behind the eye. The OFC is known to play a role in decision making, emotion-processing, and mood regulation. And while it’s also implicated in depression, it hasn’t been studied extensively as a stimulation target. Over the course of several days, the volunteers had different brain regions stimulated via DBS, including the OFC. Sometimes, the patients were instead given a sham stimulation, which acted as a control. And after each stimulation session, they talked about how they were feeling and answered questionnaires meant to assess their mood. The patients had varying levels of depression symptoms, from minimal to severe (based on a commonly used screening test they had taken prior to their surgery). Those who had no or little signs of depression didn’t experience mood changes afterwards, no matter where the stimulation occurred or if they received it at all. But people with moderate-to-severe depression symptoms did seem to have their mood boosted within minutes of having the OFC stimulated. And compared to sessions where other brain areas associated with depression were stimulated, these boosts in mood appeared to be more reliable, meaning that as people got larger shocks, they felt a greater boost. “Our findings are important because they provide a new potential target for treating mood symptoms via brain stimulation therapies,” author Heather Dawes, a co-director of the Systems-Based Neurotechnology for Emerging Therapies program at UCSF, told Gizmodo via email. The implants also let the researchers record the patients’ brain activity outside of the DBS sessions, which let them better understand what exactly DBS might have been doing to the OFC. In particular, the brain activity seen after a patient’s sessions seemed to resemble the level of activity seen when the patient was naturally in a good mood. “This indicates that stimulation may be facilitating natural brain activity underlying positive mood, rather than inducing an unnatural pattern of activity,” said Dawes. And it did so without causing the pendulum to swing back too far and making the patients hyperactive or manic, a side effect occasionally seen with DBS. There’s already been a few targets established for DBS therapy of depression, such as the subgenual cingulate cortex, a brain region commonly linked to emotion and mood regulation. But studies haven’t shown a consistent benefit from DBS treatment. Most notably, a major clinical trial of DBS was ended early in 2013, after an early analysis showed that the first wave of patients weren’t improving anywhere near as much as the researchers predicted they would; some people even got worse. That trial, while technically a failure, hasn’t closed the door on DBS therapy. Many patients in the trial who didn’t respond to DBS within the first six months (the cut-off point used to decide whether the trial should continue recruiting more patients) did show significant improvements over the long term, for instance. And other clinical trials of DBS are already underway. But it has led to questions as to whether there are ways to better refine the treatment. The OFC, because it interacts with other brain regions that coordinate aspects of mood and emotion, might provide a more consistent benefit when stimulated, the team theorizes. There’s even limited evidence that non-invasive forms of stimulation (using electrodes placed on the surface of the head) involving the OFC could also help people with depression. But for now, there’s still lot of ground to cover before we can be sure of anything. “We are truly excited by the promising results presented in this paper, but more work is needed before this becomes a clinical treatment,” said Dawes. That work will include testing out whether this same effect can be seen in people who are clinically depressed and haven’t responded to other treatments.